Funeral Services for Mary Allen, 91, of Athens are to be held at First Baptist Church in Athens at 1:00 pm on Thursday, November 1, 2018. Graveside services will follow at 4:00 pm at Restland Cemetery, 13005 Greenville Avenue in Dallas, TX. Mary Allen, beloved wife and precious mother, went home to join our Heavenly Father with a glorious sunrise, Saturday, October 27th, 2018. Mary Ellan Allen was born in Kleburg, Texas to William Jennings Bryan Harris and Mary Hedda Berryman Harris on March 3rd, 1927. She had a very full and rich life. She was a member of the First Baptist Church in Athens, Texas. 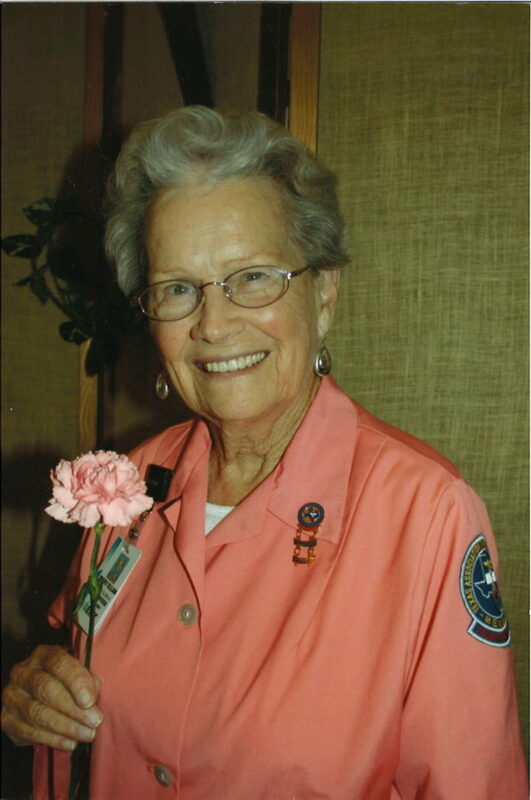 She was a lifetime member of the ETMC Auxiliary, aka the “The Pink Ladies” who were volunteers at the hospital. She also was a member of the Athens “Adorable Angels” Red Hat Society. She often volunteered for the Food Pantry. She and Popa loved to play bridge, travel with their RV group and enjoyed square dancing. Her most precious times were spent with her children, grandchildren and great-grandchildren, which were many. They brought great joy to their GiGi. She is preceded in death by her beloved husband, Hunt Allen Jr., her precious daughters June Ellan Minter ‘June Bug’ and Jean Evelyn Salazar ‘Sweet Jeanie’. She is survived by her sister, Christina Withers; remaining children, son, Ron D Cherry and his sweetheart, Sue Starkes; daughter, Joanne Crawford and husband, Walter Crawford; Son, William C. Burleson Jr. (Bill) and his wife, Janet Ann; Daughter, Jeanelle Weatheread and husband Olen Ray Weatheread and daughter, Janet Elaine Burleson. Grandchildren are Angie Brown; Ronnie Cherry; Kyla Slaughter; Katie Ubben; Walter Crawford; Monica Salazar; Candance Salazar; Londie Salazar; Peter Nowell; Jonathan Nowell; Kelly Hoff, Sherrie Daughtery, 25 great grandchildren whom she’s adored by, and a host of nieces and nephews. Visitation will be held Wednesday, October 31, 2018 from 6-8:00 pm at the Hannigan Smith Funeral Home. In lieu of flowers, we ask that donations be made to Buckner’s Orphans Hope Cottage in Dallas, Texas given in her name. Thank you all for the Love and Friendship you have given to our sweet mother and her family.